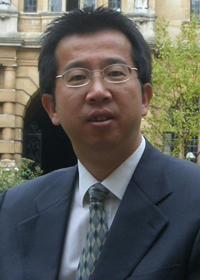 Dr. Han Zhiwu is a professor in Bionic Science and Engineering, and Vice-dean in Key Laboratory of Bionic Engineering (Ministry of Education), Jilin University. His research interests include biomimetics and simulation, functional surface biomimetics, biomimetics sensoring, biotechnology and bionic technology applied in engineering, etc. He has been selected The State Candidate of Millions of Talents Project in the New Century, the Cross-century Excellent Talents of Ministry of Education, the Expert of the State Council Special Allowance. He was Senior Visiting scholar at Oxford University in UK. He is the State Representative of International Society of Bionic Engineering (ISBE). Prof. Han has attained 4 scientific and technological awards on the state and provincial level and 2 international academic awards. He has authorized 12 pieces of the state invention patent, and taken charge of 15 projects on the state and provincial level. He has published more than 150 articles, and 50 articles are indexed in SCI. He has published two article as front cover paper in Nanoscale (IF=6.223) and one in Chinese Science Bulletin, respectively. He was invited by the Editor of Advances in Colloids and Interface Science (IF=8.12) to write a review paper named “Biomimetic mutil-funcational surface structures inspired from animals”. His research results has sparked domestic and overseas attention in science and technology, industry, aviation and business field, and were highly evaluated and reported in long interview by more than 60 famous domestic and overseas science and technology magazines or web sites, including NSFC, ACS News Service Weekly PressPac, Scientific American, ScienceDaily, EurekAlert and The Economist. ACS News Service Weekly reported in Press Release. They reported that in an effort to develop better erosion-resistant surfaces, Prof. Han and his group sought the secrets of the yellow fat tail scorpion (Androctonus australis) for the first time. His research results have been cited and evaluated positively also in a big length on more than 50 journals by some world famous scientists such as Prof. D. Fowler (FRS) and Prof. W. Barthlott (fellow of Germany Academy of Science) from 30 countries.